Table of Contents Next: Morris, Basil M.
U.S. Army. Via Paul Tillery. Cropped by author. As commander of 65 Regiment (Fukishima Regiment), Morozumi participated in the capture of Nanking, and his unit was later accused of the massacre of prisoners of war. Morozumi commanded 30 Division in Korea in March 1944. His division was transferred to Surigao in June 1944. Most of his division was fed into the defense of Leyte in October to November 1944. 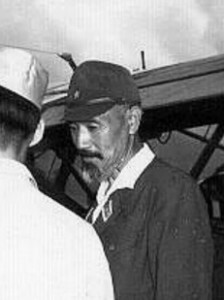 He was effectively in command of 35 Army after the commander of that army, Suzuki Sosaku, left to personally supervise the battle on Leyte. Hence Morozumi directed the Japanese defense of Mindanao against the American 24, 31, and 40 Divisions in the spring of 1945. His army was split and isolated by June. He was probably comfirmed as 35 Army commander afer 14 June 1945, when Suzuki was killed in action. Morozumi largely ignored his appointment as 35 Army commander, knowing that communications were too poor to permit any real supervision of the other elements of the command. He was joined by Tomochika Yoshiharu, chief of staff of 35 Army, whose advice he ignored.